SAN RAMON, Calif. – Fueled by the desire to spread knowledge of food allergies, Vitality Bowls is spearheading a campaign to shed light on food allergy awareness, advocacy and education. Throughout the month of May, Vitality Bowls cafes across the country are encouraging guests to try the Bowl of the Month – the Super Berry Bowl – in support of the Food Allergy and Anaphylaxis Connection Team (FAACT). 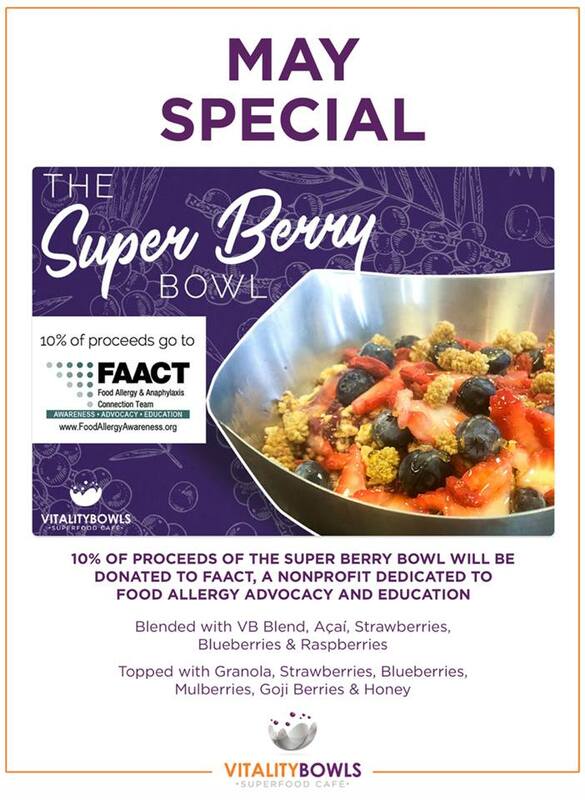 For each Super Berry Bowl sold, Vitality Bowls will donate 10 percent of the proceeds to FAACT, a nonprofit organization dedicated to increasing education about food allergies and anaphylaxis and enhancing the safety of children and adults worldwide affected by food allergies and anaphylaxis. Originating in Northern California, Vitality Bowls has solidified itself as America’s superfood café – combining a dynamic café vibe with a unique collection of menu items containing high nutritional values and extraordinary tastes. Vitality Bowls, which specializes in açaí bowls – a thick blend of the Amazon’s antioxidant-rich berry topped with a variety of superfoods – offers breakfast, lunch and dinner items made to order for each customer. All of the brand’s bowls and smoothies are free of ingredient fillers such as ice, frozen yogurt, added sugar or artificial preservatives, giving the purest taste possible. Many Vitality Bowls locations also include a full-service coffee bar, complete with espresso and superfood drinks that are packed with antioxidant-rich açaí, pitaya and matcha – for example, the Açaí Latte (espresso, açaí, coconut sugar, steamed almond milk) or the Superfood Mocha (espresso, CaCoCo superfood chocolate blend, steamed milk). Most cafes offer organic cold brew nitrogen-poured coffee and organic kombucha on-tap. For more information about Vitality Bowls and its menu items, please visit www.vitalitybowls.com. For more information about the Vitality Bowls franchise opportunity, visit http://franchise.vitalitybowls.com. FAACT\\\'s mission is to educate, advocate, and raise awareness for all individuals and families affected by food allergies and life-threatening anaphylaxis. FAACT is also your voice for food allergy awareness, from keeping children safe at school to dealing with workplace issues or simply taking the family out for a bite to eat. Managing a food allergy on a daily basis involves constant vigilance. FAACT is here to support you in managing your food allergies – today, tomorrow, and into the future. For more information, please visit us at http://www.FoodAllergyAwareness.org and follow us on Facebook, Twitter, LinkedIn, Instagram, and YouTube.